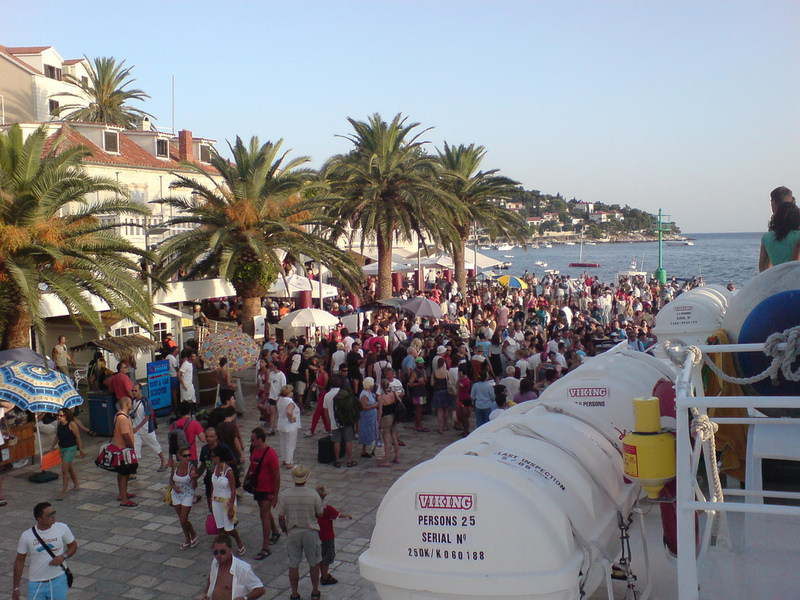 Hvar’s reputation as a party island is built on the scene around the main harbour of Hvar town. This was instigated by the seminal bar Carpe Diem, whose move into the beach-bar market helped generate a genre of venues that still do very good business within easy reach of the yacht-lined waterfront. Its rise in status going hand in hand with the island itself, Carpe Diem opened before the boom years and is slowly approaching its 20th anniversary on the Hvar harbourfront. Carpe Diem gained its reputation as a celeb hang-out by the successful launching of a VIP zone. For the rest of us, Carpe Diem can still be bags of fun, with prices just higher than normal and post-beach DJ sessions all summer long. Great cocktails too. Probably the best of Hvar’s celebrated beach bars, Hula Hula Hvar is all about sinking a cocktail as the sun goes down. A 15-minute walk around the headland from Hvar town, Hula Hula has DJs spin from early evening onwards generating a party atmosphere long before darkness has descended. Thai food is available from neighbouring outlet Bubba Gump. Essentially a rustic eatery with probably the finest selection of wines in all Croatia, the convivial Wine Bar 3 Pršuta can also be used to sample two or three domestic labels by the glass, along with locally produced cheese and the prosciutto that gives the bar its name. Seats outside offer a prime view of the comings and goings on this narrow street dotted with Hvar’s best restaurants. Ten minutes and yet a whole world away from the yachting fraternity sipping cocktails on the Hvar harbourfront, the long-established Kiva Bar is where the real party crowd gathers. People don’t come to see and be seen. The Kiva delivers good old-fashioned fun, with affordable drinks, music to mingle and move to, and an international, younger mix intent on going to the beach with a hangover the following day. Recommended. Further round the headland from Hula Hula Hvar, FALKO is a beach bar in similar vein, just without the crowds following the hype. A shack decked out in Hvar’s signature lavender is fronted by a row of loungers overlooking the island’s south-west coast and Paklinski islands beyond. Behind, a hammock beckons for a late-afternoon snooze. On offer is the usual range of cocktails, Dalmatian wines and domestic beers. Superior bruschette provides sustenance. The liveliest outlet in the island-based mini-chain of upscale hotels, Sunčani Hvar, BB Club at the boutique Riva caters to a sophisticated clientele in need of expert mixology and a few well spun tunes. It’s all very casual, light bites of shrimp snacks accompanied by a selection of champagnes by the glass. Harbour views help things along nicely.